Rush's ratings must be down. Apparently the King of Blowhards didn't get the memo from Steele. How this pain-pill addicted, Viagra smuggling moron still has an audience I'll never understand. What irony; identity politics has deprived the democrats of getting a powerhouse in the stature of Anthony Scalia like William Brennan or Cass Sunstein. She will be a disappointment for the left. Why does ANYONE pay attention to Lush Limbaugh? He is a trash-talking dirtbag of an "entertainer'! Rush you are such an entertainer!! you just make me chuckle. Reverse racist ! you crack me up! they broke the mold with you my friend... or did they?? see you at the next white supremist meeting! why don't you go die already rush you bozo !!!!!!!!!!!!!!! You got 20 million "dittoheads" We got 59 Senators (come on Al we need ya). I hate to quote W but here goes "Bring it on"!!!!!!!!!!!!!!!!!!!!!!!!!!!! Well it's nice to hear the GOP's resident expert on racism pipe up with his opinion. 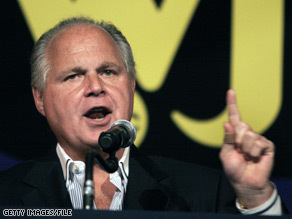 Obviously Rush is not familiar with the phrase "the pot calling the kettle black". LMAO. The moron Limbaugh is good for a laugh every day of the year. What a clown. If she was a racist, she'd fit right in with his ilk. Surprising he even tries to use that term as derogatory, he usually revels in it's glorious nature. That's a true statement.. It has been proven that menmake more that women for years..Why is Stomayor's comments racist??? The only "racist and hack" (direct quote from Rush) here is Rush Limbaugh! Will SOMEBODY PLEASE pop this red, swollen, pus-filled zit off the back of America? "She's not the brain that they're portraying her to be. She's not a constitutional jurist"
Hey numbnutz, you're not the brain you think YOU are! Furthermore, you wouldn't know a constitutional jurist if one came up and bit you in your fat, drugged out hind end. Lay down and be quiet, pill head. The less we (meaning the rest of the world) hears from you the better off we all will be. Rush is a hoot. I guess everyone who isn't a white conservative Republican male is a reverse racist. Personally, I'm a reverse-Rushist. I'm for everyone and everything he's against. Thank you, CNN. Keep his mug front and center for the GOP. Limbaugh...the gift that keeps on giving. has Limbaugh taken up (very bad) comedy?? If he wants to see the quintessential "racist" and "hack" – all he has to do is step in front of the mirror. Big suprise, Limbaugh does not like Obama's pick for Supreme Court. If anyone is racist, it is Limbaugh himself. You can add to Limbaugh's list of traits that he is hates women too. The guy is a jerk and a hypocrite.